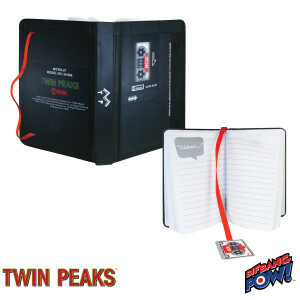 A good investigator needs a place to record his thoughts and observations, and this amazingly detailed Twin Peaks Microcassette Mini Journal should fit the bill. Inspired by the microcassette recorder carried by FBI Special Agent Dale Cooper in the award winning television series TWIN PEAKS on SHOWTIME®, complete with rounded corners and a cardboard mini-cassette bookmark! The hardcover journal measures 5 1/2-inches tall x 3 1/2-inches wide and features 192 lined pages and a cord to hold it closed. The bookmark measures about 1 7/8-inches wide x 1 1/4-inches tall.